The Rock Carvings in Tanum is a prehistoric pictorial treasure from the Bronze Age with the pictures carved on the smooth rock. 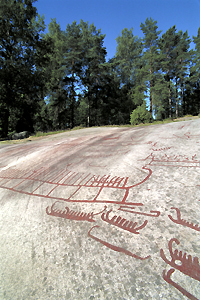 The Rock Carvings in Tanum were inscribed on the World Heritage List in 1994. 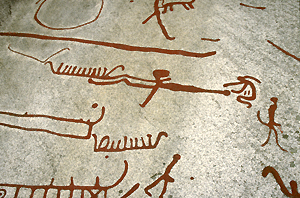 The rock carvings in the Tanum area are unique examples of Bronze Age art of the highest quality. The range of motifs provides rare evidence of many aspects of life in the European Bronze Age. The interaction between continuous settlement and land use, as reflected into the rock carvings, the cemeteries and the landscape make Tanum into an unique example of continuous human settlement during eight thousand years. Details from the Rock Carvings in Tanum.